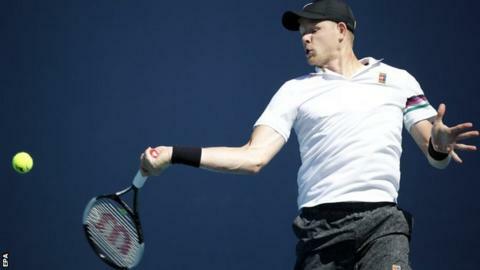 British number one Kyle Edmund cruised into the third round of the Miami Open with a straightforward victory over Belarusian Ilya Ivashka. Nineteenth seed Edmund, who received a first-round bye, beat his 110th-ranked opponent 6-3 6-2. The Briton won 81% of first serve points and converted four of five break points during the 71-minute match. Edmund will play Milos Raonic next after the Canadian's second-round opponent Maximilian Marterer withdrew. Fifth seed Kei Nishikori of Japan was beaten 2-6 6-2 6-3 by Serbia's Dusan Lajovic. World number one Novak Djokovic begins his Miami Open campaign later on Friday against Australia's Bernard Tomic.